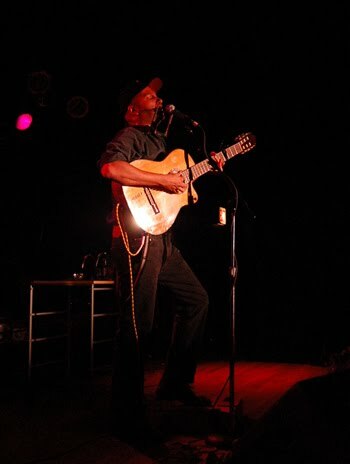 FPR correspondent Patrick Fitzell was at the April 30 performance of Tom Morello's "alter ego" The Nightwatchmen in Chicago. He reviews the concert below! Music has a long history with politics. From appearances at national conventions to campaign rallies and protest marches, musicians showcase their talents to draw more attention to worthy causes. Such is the nature of the Nightwatchman, Tom Morello’s alter ego. He appeared at the Bottom Lounge on Friday in support of the Industrial Workers of the World, the international workers union that vehemently fights to empower employees. Morello, a card-carrying member of the IWW summoned the ghosts of past musical activists to provide the generally pro-union crowd with a great night of raucous rebel music. Joining him on the bill were folk singer Bucky Halker and self-labeled Americana group the Rust Belt Ramblers. Having already warmed up, the Ramblers had an easy time of maintaining the concertgoers’ high energy level. Lead singer “Lucky” also known as Miss Bailey Dee and her leather-clad band mates cruised through their swinging set. Playing tunes off their upcoming EP “…And Dreamers We Were,” the Ramblers displayed great showmanship for such young musicians. At one time, guitarist Johnny Chastain perched himself atop the stand-up bass of Mickey T. Craft during a solo. Thanks to Halker and the Ramblers, audience members were eagerly anticipating Morello’s entrance. Donning his signature cap and dark aviator sunglasses, the Nightwatchman confidently strolled on stage. From that moment, Morello proved his one-man show can rock as hard as the other super groups on his résumé. Morello began with the rebellious “Flesh Shapes the Day” and got a huge reaction from an acoustic rendering of “Guerilla Radio.” The highlight of the night had to be the final song Morello would play, but he didn’t want to do it alone. To the surprise of on-lookers, Morello invited all who could fit to jump on stage and sing the timeless “This Land Is Your Land.” Staying on topic with the closing song, Morello’s parting message was, “Take it easy, but take it.” Despite having a strong political undertone, this night was all about the power of music. No one knows that better than Morello who will continue to set the bar for supporting causes that promote dignity and respect of all people.